Special Containment Procedures: SCP-1401-EX instances are to be kept on file at Site-19 and are available on request. Investigation into the whereabouts of PoI-5720 is currently ongoing within the state of Illinois. Illinois hospital records are to be routinely monitored for reports of unidentified diseases and disorders with symptoms in common. Any person found under the effects of SCP-1401 is to be immediately amnesticized to prevent the escalation of SCP-1401’s effects. SCP-1401 instances discovered outside of containment are to be recovered by MTF Eta-10 (“See No Evil”) and stored within a standard storage locker at the Site-19 cognitohazardous research facility. 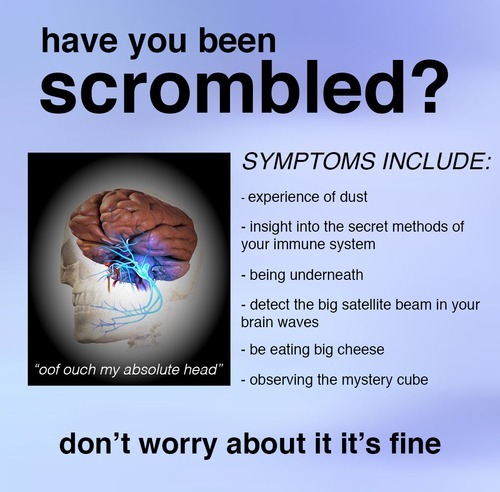 The phrasing of these symptoms is thought to be intentionally suggestive to confuse readers of SCP-1401-EX currently suffering from mild ailments. All individuals claiming to have been affected by SCP-1401-EX have been found to have symptoms unrelated to the poster’s contents, with effects of a preexisting injury or illness being attributed to SCP-1401-EX. History: SCP-1401-EX was first discovered on 08/03/██ when reports from Illinois hospitals describing a “mystery disease” were discovered. An embedded Agent was able to interview a number of affected individuals, discovering the existence and location of SCP-1401-EX from a patient. MTF Eta-10 (“See No Evil”) was deployed to contain the anomaly, which was originally thought to be cognitohazardous. Nine instances were discovered and were given to the Site-19 cognitohazardous research facility. After extensive testing, it was determined that SCP-1401-EX possessed no anomalous properties. During post recovery analysis, SCP-1401-EX was mentioned in several chat rooms associated with GoI-5869 (“Gamers Against Weed”). The following are chat logs discussing SCP-1401-EX’s initial distribution. ToasterDoot: @Sunnova I posted this one around earlier. should I make another or will more of thsee work? octogami: also what do ypu mean by posting them around? octogami: you giving these out at the county fair? octogami: so you're just putting these out in public? octogami: you just want to inconvenience yhem? ToasterDoot: Do you think the leak got all that? bones: The inactive member has left, so I would assume. ToasterDoot: I don’t know, maybe this one lacks common sense. bones: What do you think you’re going to accomplish with this whole act? bones: I would suggest having a better method of relocation next time you need to move. bones: It was difficult convincing octogami to be so cooperative. 1. Image blocked for webcrawler detected cognitohazardous properties.